SOUTH East Queensland is set to be home to a commercial-sized algae farm thanks to a $1 million grant. Brisbane omega-3 algae farming company, Qponics, has been awarded the million-dollar boost through the federal government's Cooperative Research Centre Project program. Qponics CEO doctor Graeme Barnett says algae farming investment for omega-3 fatty acids has just begun in earnest in South East Queensland. "Our goal is to produce omega-3 oils for human health, so that we do not impact on global stocks of marine animals such as fish and krill," says Barnett. The grant project, titled Translational R&D to accelerate sustainable omega-3 production, will allow Qpoincs to resourcefully construct a commercial-sized algae farm commencing this year. The project will include co-participants The University of Queensland and Nutrition Care Pharmaceuticals - a Melbourne-based global marketer of nutraceuticals and pharmaceuticals. 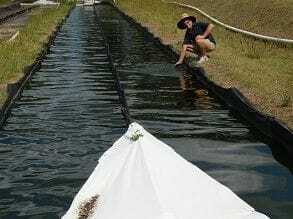 The Qponics algae farm will integrate a suite of innovative and sustainable technologies developed by Professor Peer Schenk and his research team at the University of Queensland. The site will produce a safe, natural and vegetarian-friendly source of DHA² and EPA omega-3 oils. "Studies indicate that most of the world's population is deficient in these essential fatty acids, which contributes to a wide spectrum of health disorders," says Schnek. It is expected the construction of the farm will commence this year on a near-urban site in South East Queensland. Initially it will be a 1ha farm before scaling it up to a 10ha farm in 2017.